Last weekend, I left sunny Tucson behind for a quick trip to Chicago, and I almost regretted my choice as soon as I stepped off the airplane. After a long stretch of unseasonably warm weather, the Windy City had reverted to its usual for February: cold and, well, windy. Luckily, the gig I was in town for turned out to be well worth both the travel and the winter chill. On Saturday night, downtown Chicago’s Lincoln Hall played host to Irish rock trio Bell X1, who have added a very distinct measure of warmth to their live sound on their current American tour, in support of last October’s LP release ‘Arms’. The opening act for the evening, Vita and the Woolf, take their moniker from the romantic affair between early 20th century authors Vita Sackville-West and Virginia Woolf. The band Vita and the Woolf are officially a duo consisting of singer and Jennifer Pague and drummer Adam Shumski, but on this particular occasion, they brought along guitarist Dane Galloway as well. With Pague doubling on keyboards, the three of them created a surprisingly full and forceful live sound. Pague’s singing has been compared to that of Florence (+ the Machine) Welch, and while Vita and the Woolf didn’t quite match that heady level of power and mysticism, the potential is certainly there. If that sound is up your street, keep an eye out for Vita and the Woolf’s debut album ‘Tunnels’ later this year. From the moment Bell X1 first took the stage, it was clear that something different was afoot for them. Bass player Dominic Phillips was situated at the front of the stage, an unusual position for him in my experience, but an effective one as the band opened with a soft-spoken trio version of ‘Bad Skin Day’. The recorded version of this song is quite complex, but the band pared it back to its bare minimum here, and the lyrics and vocal harmonies were notably more exposed. The reason for Phillips’ stage positioning became more apparent as the band continued through their naturally ‘Arms’ heavy set list, joined by touring members Rory Doyle on drums and Glenn Keating on keys. The new songs have a deliberately soulful simplicity about them, and a heavy emphasis on the rhythmic groove. Phillips’ bass lines were more in the forefront of the sound, most notably in recent singles ‘The Upswing’ and ‘Out of Love’, which took on more personality in live performance than in their respective recordings. Older favourites ‘Eve, the Apple of My Eye’ and ‘Flame’ were similarly streamlined, and these refined arrangements were both interesting and surprisingly engaging. They say that time flies when you’re having fun, and this show seemed to fly by quickly for everyone involved. After playing their American hit ‘The Great Defector’, frontman Paul Noonan apparently forgot that it was to be the final song in the set proper. “Oh, yeah, we’re going to play this game,” he said, acknowledging the awkwardness of leaving stage ahead of the perfunctory encore. The band didn’t keep us waiting long before they returned for a gentle version of ‘Careful What You Wish For’. This was followed by an expanded rendition of ‘The Ribs of a Broken Umbrella”, which gave Rory Doyle (who has also toured with Hozier) a perfect opportunity to show off his impressive skill and rhythmic precision on the kit. Bell X1 have found themselves a regular and dependable show closer in ‘The End is Nigh’, whose lyrical question “or will the wrong guy get the codes?” feels somehow more compelling in the present day than it did when the song was released back in 2013. Bell X1 will be wrapping up their American tour as this review goes to press, but if you’re on the other side of the Atlantic, keep your eyes open for possible live dates this summer. The band are currently scheduled to play the Summer Series at Trinity College in Dublin on the 8th of July, with Scottish alt-rock band Frightened Rabbit. You can look back at TGTF’s extensive past coverage of Bell X1 through here. After the cut: Bell X1’s set list. Irish indie rockers Bell X1 have just unveiled a new single, the first from their upcoming LP ‘Arms’. The album is slated for release later this year, but new track ‘The Upswing’ follows in the footsteps of Bell X1’s previous album ‘Chop Chop’. Frontman Paul Noonan referenced a sort of “split album” concept around the writing of ‘Chop Chop’ in an earlier interview, and from the sound of the new song, ‘Arms’ may represent the second half of that endeavour. In looking back on ‘Chop Chop’, a friend of mine described Bell X1’s recent songwriting as “subdued” and I think that’s an accurate interpretation of ‘The Upswing’ as well. The songs seem to be feeling their way around some deeply felt emotional experiences, and there is a slight uncertainty in both the music and the lyrics as the band works to find its footing. On the surface, ’The Upswing’ is an attempt at reaffirming a relationship, a commitment to sticking together through thick and thin. Its lyrics are an engaging combination of sauciness (“one day we’ll meet trouble halfway / and she’ll say just a taste and I’ll be on my way”) and tender intimacy (“on the table I’m squeezing your hand / and it’s giving me steel / to say now this is how it’s gonna be”), though its most memorable line is probably the quirky Star Wars reference at the end of the first verse. Those little lyrical peculiarities have become Bell X1’s trademark over the years, and they are matched in the musical arrangement of ‘The Upswing’. The song’s chorus line, “baby, one little push from you, got me on the upswing”, is smooth and instantly catchy, with soothing, seductive vocal harmonies whispering in the background. But it’s worth that Noonan hasn’t been given to affectionate appellations like “baby” in his past songwriting, and it does feel slightly awkward at first. Likewise, the synth and brass instrumentation behind the chorus is subtle, but also slightly off-kilter, giving the song an edge that keeps the intimacy at arms’ length. Which brings us back to the title of the forthcoming new album, ‘Arms’. It’s hard to say whether Bell X1 had the idea of “intimacy at arm’s length” in mind during the writing process, but it certainly seems to fit, at least as far as this first single is concerned. 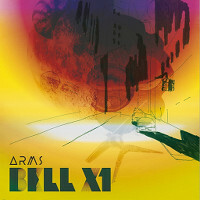 Stay tuned to TGTF for more information about Bell X1’s new LP ‘Arms’ as it nears its anticipated release. In the meantime, you can read our archive of Bell X1 coverage right back here. In my interview with him from last spring, Noonan talked about the “mentality shift” that went into the making of ‘Chop Chop’, particularly with regard to technical skill and playing the songs live. “We really wanted to do it quickly and mine a little more instinct and intuition and become better musicians.” He emphasised the live aspect of the band’s music as not just the end result, but an important part of the songwriting process. “Initially, actually, we wanted to make two short albums, and call one ‘Chop’ and the other ‘Chop’ and then have some kind of a way of connecting them that they would become ‘Chop Chop’. The time from making a record to it actually getting out is often frustratingly long, and often you spend 6 months or so sitting on a record you’ve made and are burning to get out and play and to bring to people. And so we wanted to make a record and put it out very quickly and then tour that, and then (repeat the cycle)”. Bell X1 began the North American leg of their autumn tour this past Tuesday in Cambridge, Massachusetts. Noonan hints that the set lists for these shows might be less focused on the recent ‘Chop Chop’. “We’ve added a few songs from other records to the pack this time out, it’s been good to get them together. We’ve been juggling various ideas for the set, trying something new every night so far.” Their opening act for the tour is Los Angeles singer/songwriter Gabriel Kahane. If Bell X1’s past support acts, which have included Lyla Foy and Duke Special, are any indication, Kahane should prove to be another undiscovered musical treasure. A full list of North American tour dates can be found on Bell X1’s official Web site. Thanks to Paul Noonan for taking time to answer my questions, and to Foye for facilitating the e-mail exchange.